Our attention to detail means that students are well matched to carefully vetted host families and agricultural work experience placements. Some individuals thrive on a big commercial Irish farm whilst others benefit from a small family-run mixed farm. Other students again choose to provide family support or work in agri-tourism businesses. Catering for both individual students or tailored school Groups, we are happy to welcome students for long-term placements of a minimum of three months and provide specific short-term work experience packages from one month’s duration for school groups. All students benefit from a complete support package that includes personal care and problem solving. The Equipeople Irish Agricultural Work Experience Programme provides a supported cultural, educational and personal development experience for young Europeans from diverse agricultural backgrounds. Students live as part of an Irish rural family and improve their English language skills at the same time. 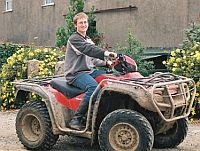 Ireland’s agricultural heritage and family ethos makes for unique work experience placements for those planning a career in equine, agriculture, veterinary, landscaping or agri-tourism fields. "My students have just returned from a four week work experience period in Ireland through Equipeople. Myself and some colleagues went to Ireland earlier in the year to meet the staff of Equipeople and visit some hosts and students who were already there. I visited sixteen placement during my trip and was impressed with both the families and how settled and content the students were. As a result, we sent a group of 24 students to Ireland in early September. They were very happy with the experience, with only one or two having minor problems. The problems, which invariably will happen, were handled quickly and efficiently by the staff of Equipeople and I would have no hesitation in highly recommending the Equipeople work experience programme to schools." "I have visited Equipeople's office in Ireland and was impressed by the professionalism and care that the staff put into every application that crosses their desk. From the moment that they receive the application until they are organising transport back to the airport, every consideration is given to ensuring that the trainee has an enjoyable and beneficial time in Ireland. I am promoting the Equipeople programme in Spain because I am confident that Equipeople will look after my people and will efficiently deal with the occasional problem. The program Equipeople offers is a great opportunity for any student willing to learn not only agriculture but also the language and culture of the friendly and charming Ireland. It is important for anyone living abroad to feel there is someone to help if needed, even if it just a chat about the experiences they are going through. The quality of the program and service is superb ." "I have worked with Equipeople for many years and have visited them a number of times and seen first-hand the great service that they provide. I have met so many of Equipeople's warm and friendly hosts and have drank a lot of tea at kitchen tables. I have met trainees from all over Europe who love the experience that is the Equipeople programme. As an English teacher, I have seen the benefit that some time spent immersed in the Irish culture and English language can have for a young person. " "We have worked with Equipeople for a number of years and have always found them to be reliable, honest and provide an excellent service to our applicants. I thoroughly recomment them and hopefully we will continue to send young Dutch people to Irish farming families for many years to come."